or it may be utilised for a baking-board. There is also a drawer below. Fig. 2 shows the appearance of the front of the table. 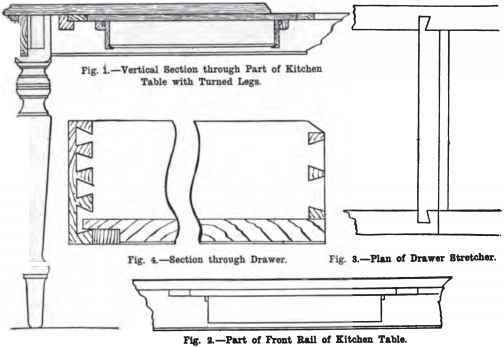 Part of the front rail is cut away to allow for the thickness of the board, and then stretchers are dovetailed down to it as shown in Fig. 3. The size of the drawer is next decided on, the necessary amount of stuff is taken out. and rebated stretchers are inserted between front and back rails. The drawer (Fig. 4) has pieces screwed to the sides to travel along the rebate in the stretcher, as clearly shown in Fig. 1. The bottom of the drawer is checked in square, and blocked with square fillets. This kitchen table may be made of good yellow pine throughout, with pins inserted through the legs into the tenons. Blocks rtkay also be glued in at the back of the leg and rail. Bottom stretchers may be dispensed with when the rails and legs are well l>ound together.